Markets in Hong Kong, Vietnam, Taiwan and Korea are closed this week as people across Asia celebrate Moon Festival, one of the culture’s most beloved holidays along with Chinese New Year. Moon Festival’s origins center around a husband (Houyi) and wife (Chang’e), who were sentenced to live eternally separated on the sun and the moon. Chang’e, representing “Yin,” lives on the moon and Houyi, representing “Yang,” lives on the sun. Once a year, on the night of the Mid-Autumn Festival, Houyi visits his wife and that is the reason why the full moon burns brightly on this night. To read the complete version of Chang’e and Houyi’s tragic tale, click here for a version Sherman Guo from CICC shared with us earlier today. For many, the yin and the yang illustrate the importance of having balance in life. Investors must find the right risk/reward balance. Businesses must find the right capital spending/revenues balance. And, we all must strive to find the right work/life balance. Balance is also a crucial goal for China’s economy—the economy must not grow too quickly or risk a sharp correction. Just this year, China has weathered an epic battle with inflation, drought and floods, poor global macroeconomic conditions, massive accounting/corruption scandals and a tragic accident on one of its marquee achievements—the country’s high speed rail system. We’ve discussed the tremendous build-out of China’s high speed rail system before (Read: Railway Revolution Builds China’s Consumer Culture). Last week, members of our investment team and board of directors were in China doing research and you can see from the photo that we were lucky enough to see what traveling at the speed of China feels like firsthand. 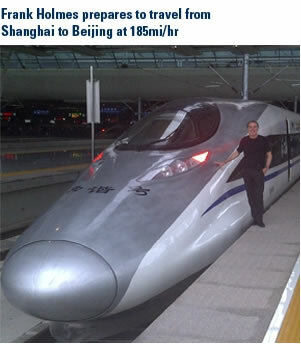 Our train averaged 185 miles per hour during the 923-mile trip from Shanghai to Beijing. I’ve traveled to all corners of the world and have seen many things during my travels, but viewing China’s explosive growth as it flies by you is something I will never forget. China remains the beacon of hope for the global economy, the largest and, many times, the “sole engine of the world economy,” BCA Research says. China’s real GDP is forecasted to grow 8.9 percent in 2011 and 7.8 percent in 2012, according to ISI Group. This is a slower rate of growth compared to recent years but “doesn’t look like an economy struggling under tighter credit conditions,” GaveKal research says. Many of China’s critics, such as Jim Chanos and Hugh Hendry, claim China’s current economic status is a mirage created by government stimulus and relies on exports. However, examination of China’s economic growth over time (see chart) reveals that consumption and gross capital formation are the two pillars lifting China to the top. Ending the country’s dependence on exports is the “professed pursuit of quality over quantity,” says GaveKal and became an immediate necessity for China to maintain economic stability after exports collapsed by 40 percent from September 2008 to January 2009, triggering a sharp slowdown in growth, BCA says. Recent data shows China has kicked the habit as exports have contributed little to the country’s growth in 2011. 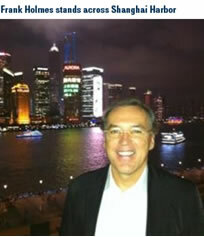 Net exports accounted for 18 percent of China’s total 14.2 percent GDP growth in 2007, according to CLSA’s Andy Rothman. During the first half of 2011, exports have a negative contribution of -0.7 percent of China’s 9.6 percent GDP growth and accounted for only 12 percent of total industrial sales revenues. We’ll debunk more tall tales of China’s export economy in a moment. Strong income growth has triggered a rise in domestic consumption. CLSA says inflation-adjusted wages in urban areas rose 7.8 percent in 2010 and have risen another 7.6 percent during the first half of 2011. As a result, urban retail sales and household expenditures increased 17.4 percent and 12 percent during the second quarter of 2011, respectively. In addition, rising migrant wages and higher farm-gate prices have led to a 13.7 percent increase in real rural incomes and 16.8 percent increase in rural retail sales during the first half of 2011, CLSA says. ISI Group reports that retail sales increased 17 percent on a year-over-year basis in August and the firm sees “no reason at present to anticipate any lasting weakness in China’s healthy consumer sector.” As one example, China recently surpassed the U.S. to become the world’s largest personal-computer market, The Wall Street Journal reports. An analyst from research firm International Data Corporation (IDC) told the WSJ that they estimate China’s PC shipments to reach 85.1 million in 2012. ISI is especially bullish on luxury goods citing the “work, earn, consume” lifestyle much of the Chinese population has adopted in recent years. We’ve discussed the potential of the luxury goods market in China several times but the sector has been held back by high luxury taxes that can reach up to 50 percent on some products. Sales are growing quickly but luxury sales only make up around 1 percent of the current market, GaveKal says. A primary driver of China’s economic growth has been fixed asset investment (FAI), which slowed to 23 percent in August but is maintaining the 23-25 percent pace the country has seen in recent years, CLSA says. Strong FAI is bullish for commodities demand as increased industrial activity and construction gobbles up more cement, iron ore, crude oil and copper. Manufacturing activity has increased 32 percent so far in 2011, outpacing that of a year ago and driving the profits of industrial firms to rise 28 percent on a year-over-year basis, data from CLSA says. Since 2004, total FAI for manufacturing has jumped a staggering 261 percent in RMB terms, nearly double the increase for real estate, 167 percent over the same time period, says data from ISI. In addition, FAI by private companies has outpaced that of state-owned enterprises for 17 consecutive months. Rothman says this is indicative that private firms are financially healthy and anticipate strong demand. This isn’t because the Chinese government doesn’t have the money. Revenue increased more than 21 percent in 2010 and has already jumped more than 31 percent in 2011, CLSA data shows. According to BCA, “China has one of the smallest fiscal deficits and fastest nominal GDP growth rates among major world economies.” Government expenditures for this “socialist” country only account for 23 percent of GDP, well behind other countries such as Brazil and the U.S. (both roughly 40 percent), the United Kingdom (about 43 percent) and Ireland (around 70 percent). While China’s “ghost cities” have stolen headlines, China’s real estate market sits on a much stronger foundation than China bears would have you believe. In reality, the property market is actually in a much healthier position than it was at the start of the year. CLSA says the government’s focus on keeping housing price growth under control and limiting the availability of mortgages has resulted in “none of the 70 cities monitored by NBS [reporting] price increases of more than 1 percent” on a month-over-month basis in July. This is in stark contrast to July 2010 when CLSA’s composite of 40 cities across the country jumped 17 percent on a year-over-year basis. For the year, new-home sales were up 12 percent on a year-over-year basis through July and year-over-year residential starts increased 27 percent. In addition, construction on most of the social housing projects planned for 2011 has already begun, GaveKal says. Despite this relatively tame market, GaveKal cites Nouriel Roubini as saying these “ghost towns” are evidence that China’s excessive investment in capital stock has crossed a critical threshold—a bubble. GaveKal says “Hundreds of once-empty districts across the country, from Shangdi in northwest Beijing to Donghu in southeast Wuhan, have turned into flourishing neighborhoods.” According to GaveKal’s research, China’s cities absorb 20 million new people each year, creating a current shortfall of 75 million housing units. They estimate 40-50 million new urban households will need to be constructed by 2020 in order to meet demand. The chart on the left illustrates that a large portion of China’s urban growth will take place in suburbs as cities with 1 million people or less experiencing the most growth. Around the globe, no “rich countries” have more than 10 percent of their workforce in agriculture and no “fairly well-off” countries have more than 20 percent. The chart on the right compares GDP per capita of China, South Korea and Taiwan as their workforces transitioned away from agriculture. When China’s workforce hit the 50 percent level, the country’s GDP per capita was $2,000—roughly the same as Taiwan. Today, China’s GDP per capita stands at $7,500 but the country is still carrying a larger percentage of farmers and ranchers than South Korea and Taiwan were at the same level. Perhaps some of China’s negative press stems from American’s fear that China is taking our place atop the global hierarchy. There are a couple of reasons that’s just not true. One, many American companies are riding the wave of China’s growth all the way to the bank. Of the companies held in the S&P Composite 1500 Index, 707 have revenue growth above 10 percent. Many are America’s largest and oldest companies, who long ago recognized China’s transformation and shifted capital overseas to continue growing their revenues. Caterpillar already has 16 manufacturing facilities, 3 research and development centers, and 3 logistics and parts centers located in China. In a recent announcement, the world’s leading manufacturer of construction and mining equipment says it is expanding operations again. Up and running by the fall of 2012, Caterpillar plans on building a state-of-the-art proving ground and a large wheel loader manufacturing facility, a company press release indicates. Executives of Caterpillar say this new facility will support a growing customer base in China and across Asia. These are only a few examples of how American business is keeping its entrepreneurial spirit and sustaining jobs by reinventing itself in the developing world. Some will say that they are sending American jobs overseas but the U.S. economy is actually much more domestic-oriented than you’d think. For example, U.S. imports only accounted for 16 percent of U.S. GDP in 2010 with imports from China totaling 2.5 percent of GDP. U.S. consumer spending on goods from China was only 2.7 percent of total spending in 2010, according to a new report from the Federal Reserve Bank of San Francisco. Consumer spending on items manufactured in America was nearly 90 percent of the total. A greater myth many believe is that most of the $100 you spent shopping at Wal-Mart last weekend heads back to China. However, the San Francisco Fed reports shows that for every dollar spent on an China-made item in the U.S., 55 cents lands in the pocket of U.S. businesses for services such as marketing and sales. There’s also a trickle-down effect of Chinese goods. Laura Baughman, president of the Trade Partnership told USA Today that “because we import from China, prices are cheaper, consumers have more money in their pocket, and they go out and spend more” which creates a greater number of jobs than are lost. America also sends goods in the other direction. China is America’s third-largest export market with the total U.S. exports of electronics, agricultural and other products to China rising an astounding 468 percent from 2000 to 2010, according to USA Today. There are many questions surrounding the global market but the Chinese economy remains headed toward the moon. The country, of course, remains vulnerable to external forces but we believe the economy’s strong momentum will be enough to carry the country through, should volatile times persist. U.S Global’s global market insights are now available “on the go” with mobile applications for the iPhone, Blackberry and iPad. Download the free apps today and access a whole new world of investing with the swipe of your finger. Download the apps. Standard deviation is a measure of the dispersion of a set of data from its mean. The more spread apart the data, the higher the deviation. Standard deviation is also known as historical volatility. All opinions expressed and data provided are subject to change without notice. Some of these opinions may not be appropriate to every investor. The S&P 500 Stock Index is a widely recognized capitalization-weighted index of 500 common stock prices in U.S. companies. The NYSE Arca Gold BUGS (Basket of Unhedged Gold Stocks) Index (HUI) is a modified equal dollar weighted index of companies involved in gold mining. The HUI Index was designed to provide significant exposure to near term movements in gold prices by including companies that do not hedge their gold production beyond 1.5 years. The MSCI Emerging Markets Index is a free float-adjusted market capitalization index that is designed to measure equity market performance in the global emerging markets. The U.S. Trade Weighted Dollar Index provides a general indication of the international value of the U.S. dollar.